Somewhere in the world, two warring sides of a political border share at least one thing in common, and that is their love for food. Indian cuisine is one that you can no longer escape and a common sight on the high street, yet one of the most under-appreciated food cultures (for me, at least!) is Bengali food. It would be a shame to keep these treats within the confines of our kitchen walls and the instructions under the breath of our cantankerous old grandmothers, so I've decided to start a Best Of Bengali series! The first recipe I've decided to share in time for an iftar at my gran's is shingara. 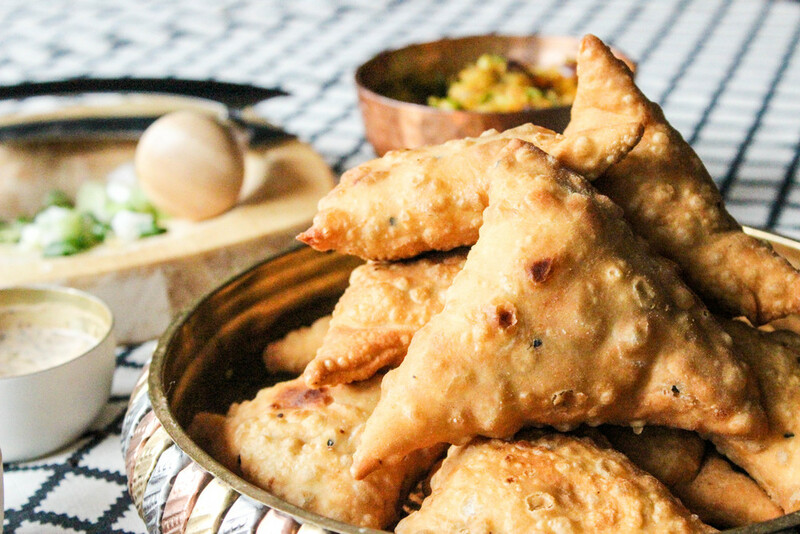 Think of it as a bigger, rounder, flakier samosa with a vegetable filling. They're usually served as a starter with tamarind dips or sweet and sour chutneys. 1) To make the dough, mix flour, oil and salt dissolved in water. It should be smooth and hard enough to hold its shape. Leave the dough covered to one side. 2) Heat a shallow pan and fry the cumin seeds first. Add onion and remaining vegetables when the cumin starts to crackle. Stir in the salt and spices. Garnish with coriander once the vegetables are tender. It is up to you whether you want to mash this mixture or keep the pieces whole for some texture. 3) Take the dough and knead it for a minute. You want to create a yield of 6-8 equal balls. 4) This is the tricky part: roll the dough into circles as if you are making roti and cut each "roti" in a diagonal half. 5) Create a cone and seal the edges with the flour and water paste. Leave the wide end of the cone open and fill with your vegetables. When you come to seal it, it should look like a pyramid (or at least, not as flat as a traditional samosa). 6) Repeat this step with the rest of the dough balls and you should have 12-16 shingara. 7) Heat a frying pan with a=oil for deep frying. Test the oil is reading by dropping a crumb of leftover dough and checking that the oil bubbles. Fry the shingaras a few at a time as they do expand. 8) Fry them until crispy brown and serve them hot with a spicy tamarind dip and a cooling raita.